Small utilities bundled with Windows are often blamed… For anything actually. For eating hard drive space, being insufficient, too simple or too complex, etc. Some stay as they are forever, some actually have improved versions. PowerToy Calculator is unofficial calculator replacement from Microsoft. 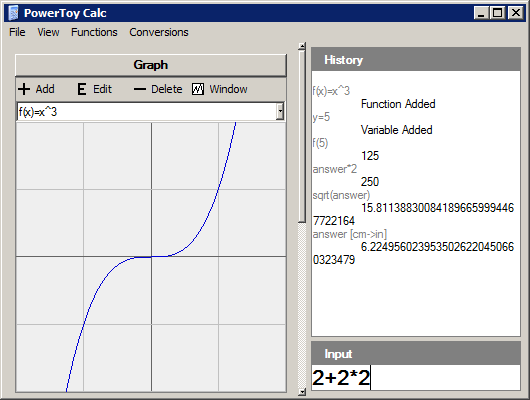 PowerToy Calc is text-based calculator. It means that instead of inefficiently clicking virtual buttons you simply type something, hit enter and it is calculated. All calculations are shown in history log. working with decimal, hexadecimal and binary. Easy to use and very copy/paste friendly. Freeware. Doesn’t work on Vista. I hadn’t bothered to check if it is portable but it works without installation. I use the old calculator quite often. This one seems to be much nicer and quicker. I will give this a try. Thanks for the link. Honestly, it’s something I will install right away. I often have to compute some “complex” equations quickly and this is the way to go. I was using default calculator for a long time myself. Becase it’s… well – default calculator. :) This one owns it. I tend to actively look for software that fits my needs best. Over time it adds up to hundreds megs of good stuff. Copy the installed exe file from XP to Vista machine and set the compability option to WinXP. Thanks for checking, Ky. Hadn’t checked myself, all PowerToys are Vista-incompatible according to Microsoft. I am studying algebra, so I was looking fwd to trying this. However, when I enter functions to be graphed, nothing happens! I try to give a variable a value, and nothing! Even in slope-intercept form! And there is no help file. Any ideas? What exactly you are trying to plot? Does example function already included plot fine for you? I am trying to plot linear and quadratic equations. When I type one in the function input pop-up, nothing happens. Example: y=2x-5. Nothing. Tried f(x)=2x-5. Still nothing. Is it me?